This past week, Torque News had an opportunity to test the new 2019 Jaguar I-Pace EV400 HSE. The quick summary of our test is that the I-Pace is now our favorite Jaguar and we have tested every current model except the E-Pace. Jaguar's I-Pace takes a form and price point that no current Tesla model does. It is a two-row, all-wheel drive crossover built more for all-road capability than an SUV-type crossover. Tesla does not make a crossover this size. Nor does Tesla have a crossover vehicle in the price range of the I-Pace. The I-Pace starts at about $71,000 and a fully-loaded model like our HSE tester runs up to the low $90Ks. Our tester had an as-tested price including destination and delivery of $89,310. The Tesla Model X, by comparison, starts at about $90K and can rise to about $160K with all options. Jaguar dealers can also discount a new Jaguar. Tesla will not. The price point and size of the I-Pace are just the start of the differences between the offerings Jaguar and Tesla have. The Tesla Model X has a lot going for it, notably the unique gullwing doors. However, those doors also preclude the Model X from being a true crossover. Every vehicle with any outdoor activity focus should have a roof rack to carry gear in a pod, bikes, paddle boards, snowboards, kayaks, and all that jazz. Tesla's Model X can't do that. As our top of page image shows, the I-Pace can. If you prefer plastic-based seats or cloth, that's great. We like microfiber suede and leather in combination with heat and ventilation in our luxury cars. But you can't get that in a Tesla. Because Tesla has decided that you shouldn't. Jaguar offers the best leather in the world. Ours had red Windsor leather and it was amazing. We're being a bit cheeky here since our coverage often takes aim at tax breaks for luxury EVs, but the Jaguar I-Pace has a substantially better tax break for buyers. Jaguar buyers enjoy a $7,500 tax credit and there is no end in sight. Tesla buyers get just $3,750 now, $1,875 after July 1st, and nothing a year from now. Tesla's Model 3 sales have killed the tax break for Tesla shoppers. Tesla has a fantastic UI and an infotainment system that is simply groundbreaking. Yet, it does not have Apple CarPlay or Android Auto integration. There are plusses and minuses to every infotainment package, but cars with price tags around $20K now are commonly offering both Android Auto and Apple CarPlay. The best thing about this technology is that if you are for some reason dead set against it, you can simply not use it. If you do use it, you know the upsides. Tesla does not offer this technology, Jaguar does, and we found it to be perfect in its operation. Oh, and AAA says that Apple CarPlay and Android Auto can be less distracting than automakers' native systems. So it's "safer." One thing that both the I-Pace and all Tesla vehicles share is amazing performance. The I-Pace can accelerate to 60 MPH in about 4.5 seconds, but if you are an EV fan and have driven some, you understand it is the instant torque that is the difference maker. The 510 lb-ft of torque the I-Pace packs enables amazing performance at this price point. Tesla does not have a vehicle in this segment yet, but when the company does offer it, will it have the same performance at this price point? We think the answer is "yes" but we will be waiting - and waiting - and waiting to find out. Maintenance is not included with the Model X. Tesla offers plans to sell you the maintenance it recommends. Why does Tesla need to sting you for things like tire rotations and inspections after it charges you $160K? Jaguar includes maintenance - for all of its vehicles - for five years. Tesla has its strengths, and they are well known. Autopilot. Superchargers. We felt it was fair to point out things that Jaguar has that Tesla does not. What have we left out? And the Model X is a big suv while the i-pace is basically a small hatchback so those two should not be mentioned in the same sentence and never compared cause they are not comparable! We dedicated the entire second paragraph to making your point. Tesla does not have a crossover the size of the Jaguar I-Pace. Nor does it offer one in the same price range. You are correct that Tesla does not offer this type of vehicle. On the other hand, Jaguar does not offer a large SUV like the X, or a large hatchback like the S.
How much did Jag pay you for this biased tripe??? I've driven both and there's no comparison. If they were to knock another $20k off the base price of the Jag it would be priced correctly. Both what? I-Pace and what model Tesla? How sure are you that a Jaguar dealer will offer money off the I-PACE? Did you try? My understanding is because Magna Steyr is only making 13k of them per year, they aren't in stock and many dealers won't have any (since many of the 13k were pre-ordered). Dealers don't typically discount such limited edition vehicles. First I was very unsure. So I checked with Jaguar PR that dealers were allowed to discount. I know they are independent companies, but dealers do sometimes agree to the "no dicker sticker" marketing plans of their automaker-partners. The place I bought my Subaru for example. Anyway, Jag confirmed dealers can deal. Will they? I have no idea. If they are all sold out for the coming year, why would they? Later though, they won't have to break a cardinal rule to offer buyers a discount. In the story, I didn't say they would. I said they could. It's a nice article John. If fairly biased against Tesla and for the iPace. It is interesting that you consider the iPace's smaller size a ding against Tesla because they do not offer a small crossover. The Model X is clearly in a different class with about 50%+ more interior space than the iPace, which has far less interior storage than even a Honda CR-V. The interior space is comparable to the $37k Chevy Bolt, as is the Jag's 234 mile battery range. The base Model X starts at about the same price as your loaded HSE tester, but starts with 270miles of range, offering similar acceleration to the iPace. The Model X Performance model starts at $117K (3.5 sec 0-60/289 mi range) and the available ludicrous mode does add $20K more, but it provides supercar-like 2.8 sec, 0-60 capability. With those points said, I do like the Jaguar iPace. It has a beautiful design inside and out, and would be a worthy rival for the Porsche Macan Turbo, which says a lot. 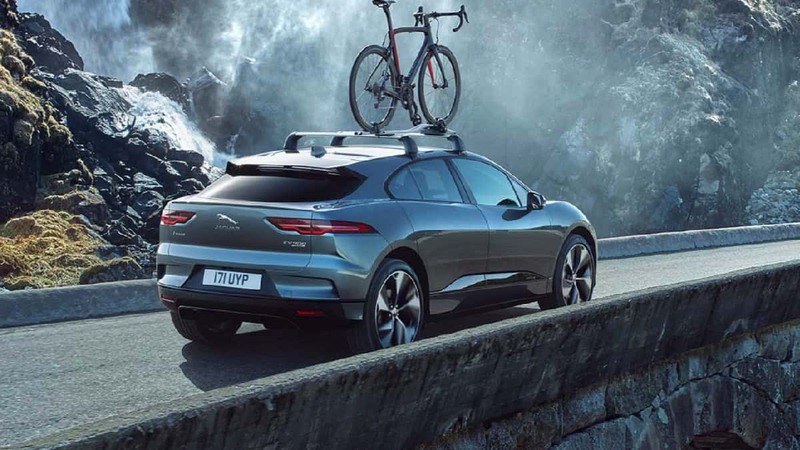 Even though Tesla comparisons are inevitable, it is fair to say that the Jaguar iPace is poised to fill the demand for a smaller, European, sport, luxury crossover, EV. And currently the only close competitor in that slot looks to be the upcoming Audi E-Tron. Jaguar deserves credit in being the first to market in this class, and it looks like they did a very good job in their engineering and design to make it competitive, not only against other established EVs, but importantly against the gas powered rivals that own 95% of this market.